Solid optical glass Two glass triangles are formed out of melted blocks of solid optical glass. The opaque sides of the triangles contrast strongly with the pristine colourless glass that they surround. The two triangles are part of a larger series called Formes Brèves (Brief Forms). Bernard Dejonghe's work intends to reduce shapes to their essence. The triangles as well as the title of the piece are characteristic of this philosophy. Colourless optical-quality glass is cast and fired. In doing so, a rough white crust forms. This crust is then chiselled away from two faces of the moulded sculpture. In turn, these are then polished leaving two crystal-clear faces surrounded by white rocklike walls. Sculptor and glassmaker Bernard Dejonghe undertook a training in plastic arts and ceramics at the École des métiers d’art (School of Crafts) in Paris. The school, now the Picasso Museum, provided Bernard with general training in drawing as well as basic ceramic making techniques. 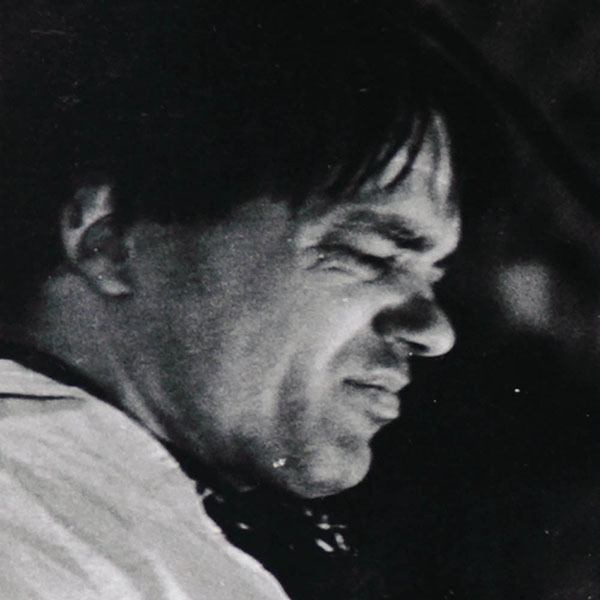 Bernard then spent a number of years reading and studying different arts in a journey to express himself. This led Bernard to dedicate himself to ceramic and glass sculptures. Bernard now develops innovative technical processes to work on fundamental forms, reducing them to their simplest essence. 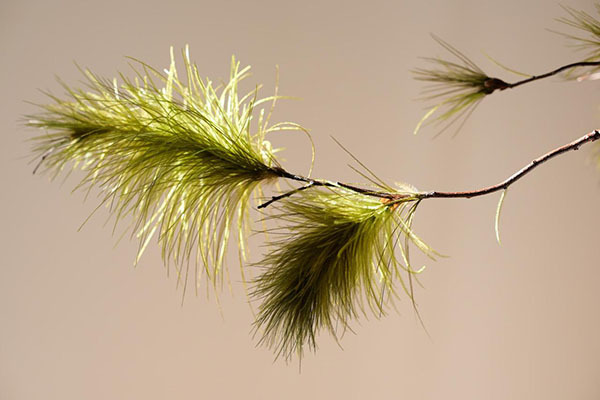 24 karat gold, synthetic thread Cathy Chotard draws her inspiration from plants and their structure. She applies the concept of similarity to her work, meaning that while two leaves are similar, they are never identical. 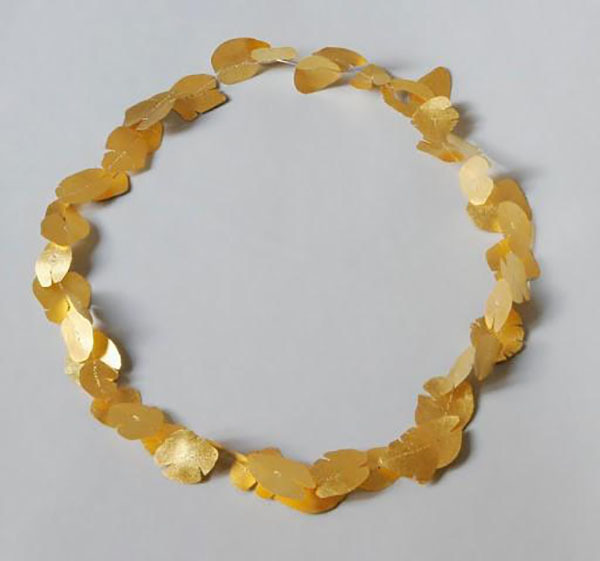 This 24kt gold necklace was inspired by plant structures and formations, both in the petal-like design of the gold and in the plant-like structure of the fibres that connect each matte gold petal. Delicate, thin laminated 24kt gold leaves are interconnected by hand with a complex weave of Siglon fibre. Cathy Chotard graduated from the School of Fine Arts of Rennes in 1970. Her passion for jewellery drove her to undertake training to be a goldsmith-jeweller in the workshops of Fontblanche, Nîmes, in 1993. 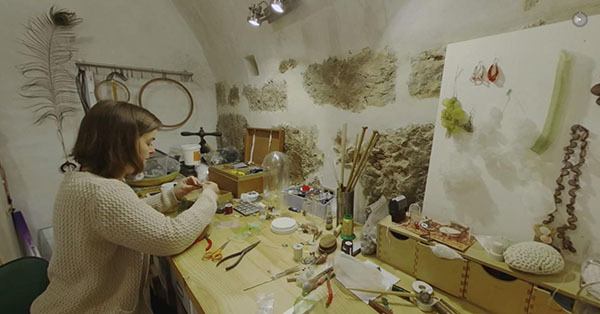 From her workshop in Montpellier, Cathy now dedicates herself exclusively to working with precious metals. Cathy’s work has been exhibited in France and internationally. Cabinet 2: Cardboard, composite material, aluminum, pebble powder, mahogany, rubber. Age-old materials and unconventional contemporary materials are worked on with traditional tools following age-old cabinetmaking techniques to produce these two cabinets. 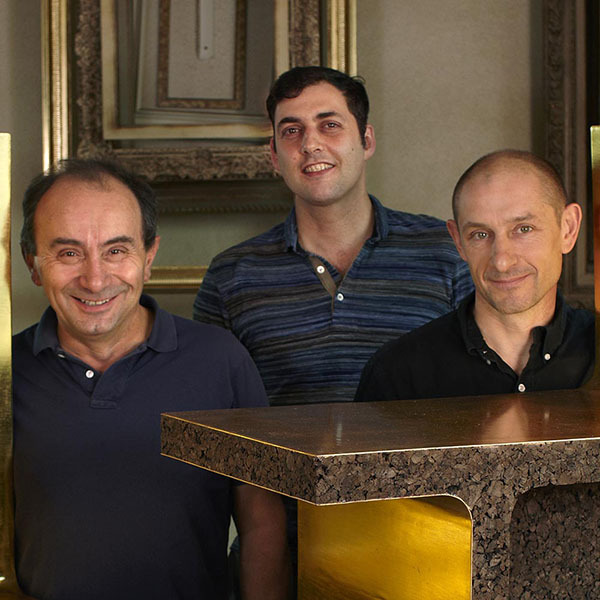 Ludovic Avenel trained at the École Boulle in Paris, and created his own cabinetmaking workshop in 2008. Ludovic embraces techniques and knowhow of the past, integrating them into his contemporary, avant-garde and innovative works. His experimentation with new materials questions traditional knowledge. The sometimes conventional aspect of his works seeks to reconcile contemporary materials, design and craftsmanship. Aronia arbutifolia, kakishibu, Soemmering pheasant feathers (Syrmaticus soemmerringii), ostrich blondine feathers (Struthio camelus) The trompe-l’oeil is an emblematic trait of Nelly Saunier’s work. Her residency at Villa Kujoyama in Japan inspired this piece. Pheasant and ostrich feathers replace leaves on the resinous branches of a twisted bonsai tree. The wood of the bonsai has been coloured using the ancestral Japanese Kakishibu dyeing technique. Using different types of feathers and wood, Nelly Saunier creates a minutely detailed trompe-l’oeil. Nelly Saunier is a master artisan in feather work. Over the past 30 years, she has dedicated her imagination, talent and exceptional knowhow towards creating feather designs, in particular for the luxury industry and acclaimed tailors. She carries out each step in the manufacturing stage of her creations. Despite a high demand for her work from luxury brands, Nelly Saunier dedicates part of her time towards creating works of her own. 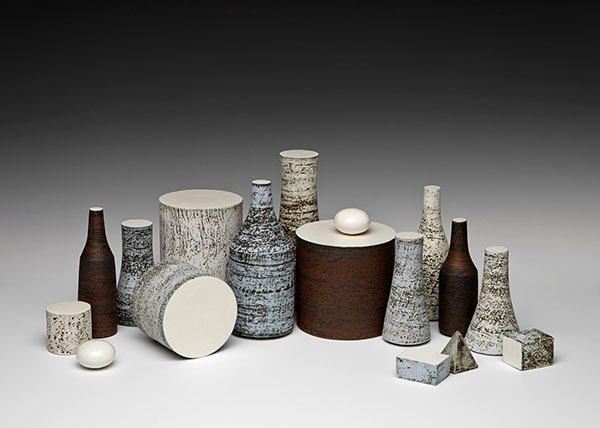 This work is an installation of various ceramic tabletop objects, glazed in autumnal colours, with a tree-bark pattern. This work, like others by Kristin McKirdy, has been inspired by the painted still lives of Italian painter Giorgio Morandi. Rigour and simplicity are integral to the realisation of her sculptures, which are conceived as families of objects that evoke the sobriety of early age furniture. Earthenware is slumped and turned on a lathe. After a first firing in the kiln, Kristin McKirdy decorates the cooked ceramic surface with bark-like designs. Kristin McKirdy graduated with a Master of Fine Arts degree from the University of California (UCLA) and a MA in Literature from the Sorbonne. The two-dimensionality of visual arts strongly influences her approach to ceramics as well as her choice of composition and subject. Kristin is an art historian fascinated by archaeology and Mediterranean civilisations. These interests are strongly reflected throughout her works. Kristin has participated in numerous collective and personal exhibitions around the world. Rabbit skin glue, pigments, linseed oil and silk powders, Japan papers, 120g / m2 Vergé and 300g / m2 Vellum This wallpaper excerpt from a whimsical garden pays tribute to the flower as an ornamental mirror. The paper becomes a laboratory for an aesthetic quest. Handmade wallpaper using traditional techniques of production and printing. These techniques can include surface printing, gravure printing, silk screen printing and finishing the wallpaper by hand. François-Xavier Richard is a painter, sculptor and engraver. He studied at the École des Beaux-Arts in Angers, during which time he also worked on designs for theatre and scenography. It was at this time that he first got a taste for artisanal methods of production. After his studies, he was asked to participate in an experiment teaching crafts to young students. It was here that he first came into contact with the world of wallpaper. 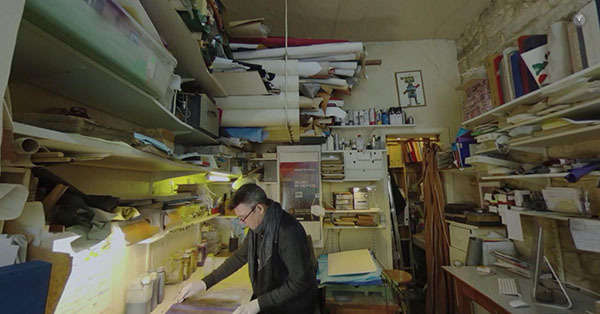 After working for a wallpaper-producing company he decided to create Offard's studio. 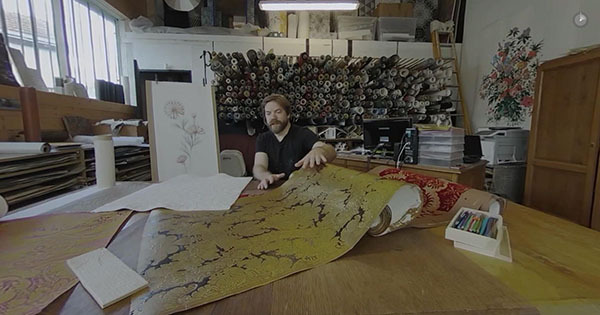 He now specialises in making handmade wallpaper and prints contributing to the renewal of a craft almost forgotten since the mid-20th century. The studio explores new avenues, including combining traditional printing techniques with the use of new technologies. Oak A single 300kg trunk of oak is carved into an organic boat-like shape. Variations in the ochre hues of the unplaned wood, emphasised by variations on the surface - the veins of the wood, natural cracks and spots - accentuate the growth stages of the tree. Hand carved from a single block of wood using traditional techniques and instruments. The entire process is carried out by hand without any motor-powered machines. Hand carved from a single block of wood using traditional techniques and instruments. 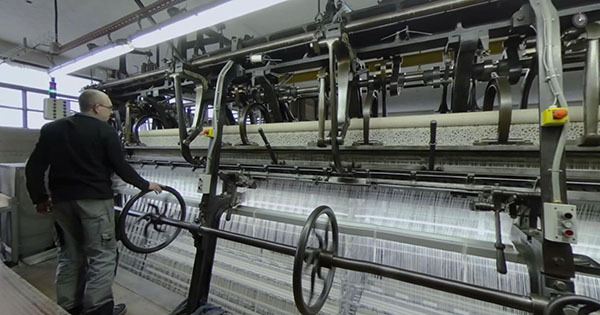 The entire process is carried out by hand without any motor powered machines. Julian Schwarz was born in Birmingham, UK, into a family of artists and artisans, his father being a painter and his grandfather a carpenter. In his early career, he experimented extensively with woodworking and painting but ultimately dedicated himself to woodcarving. Julian has since settled in France and uses many traditional woodcarving techniques when sculpting. Three key stages punctuate his work: the choice of the wood; the choice of manual and traditional tools; and the finalisation of the form. Earthenware, enamel This set of five black enamel clay jars represents the demographic curves of five countries, modelled in three-dimensions. Each jar represents a different country: France, the United States, Japan, Egypt and Russia. Life and death sculpt the jars, since the proportions of each differs according to the life expectancy of each country. 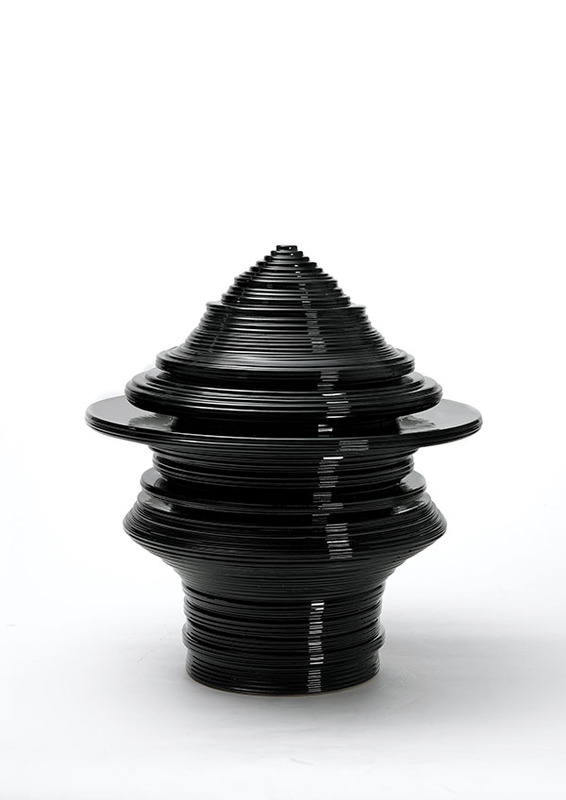 This black enamel clay jar represents the demographic curves of a country, modelled into three-dimensions. It is part of a series of five jars. Each jar represents a different country: France, the United States, Japan, Egypt and Russia. Life and death sculpt the jars, since the proportions of each differs according to the life expectancy of each country. Claude Aïello is a ceramicist from Vallauris who comes from a long line of ceramicists. In 1998, in an attempt to revive their ceramics industry, the town of Vallauris organised an event where designers and ceramicists paired up to create original pieces. Of all the artisans associated with this venture, only Claude would make this method of collaboration a central feature of his work. 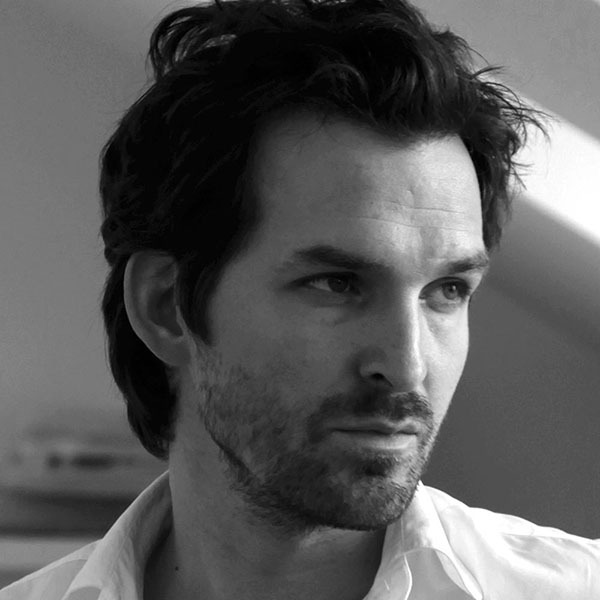 Mathieu Lehanneur is a French designer at the forefront of the design scene who graduated from the École Nationale Supérieure de Création Industrielle. He turns to science for inspiration and applies this to the fields of arts and craftsmanship. His works can be found around the world in museums inicluding the MOMA in New York. Mathieu has designed works for international brands. Expanded cork and gold leaf The primary function of Sellettes (Stands) is to present and highlight objects. Composed of cork and gold leaf, these objects introduce the presence of two antonymic materials into interior decoration, one modest and natural, the other precious and rare. In the eyes of the designer they symbolise "the beauty of the world and the talent of men". Expanded cork is shaped into the desired form. Once this process is finished, the stand is covered with a primer. Once dry, a gilding size (glue) is applied with a paintbrush. Gold leaf is then applied to the prepared surface. RG Les cadres Gault was founded by Emile Gault and opened its first shop in 1936. The workshop specialises in the manufacture of carved wooden frames. From generation to generation, staff train new apprentices. Today, Frédéric Richard has taken over management of the workshop and shops in Paris and Geneva. Accurate gestures, love for the craft, experience and creativity are the basis of RG Les Cadres Gault. Having been trained in gilding and woodcarving, Frédéric Richard took over a company, RG Les cadres Gault (The frames Gault), which specialises in producing handmade high-quality frames. 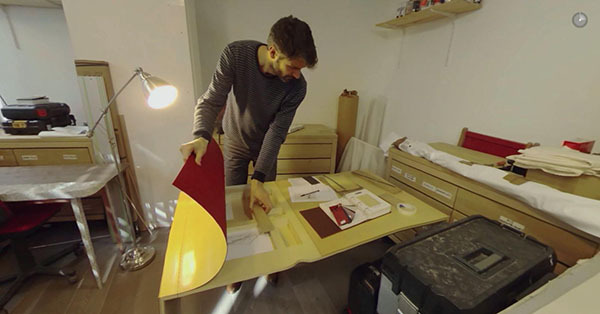 Emmanuel Joussot follows in his family's footsteps by cabinetmaking. 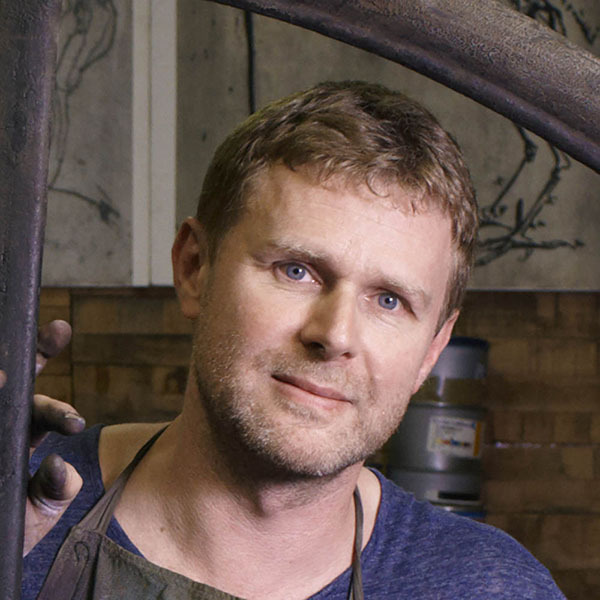 He creates high-end contemporary furniture as well as panelling, antique furniture and gilded wood. He works closely with designers and interior decorators to create interior layouts and single pieces or limited series. Éric Benqué's designs question the relationship between objects and the space intended for them as well as the position of humans in his designs. This has led him to work alongside artisans in luxurious urban settings and rural areas in France as well as remote settings in African and India. Éric regularly works alongside architects who help him put a special emphasis on spatial dimensions in his designs. 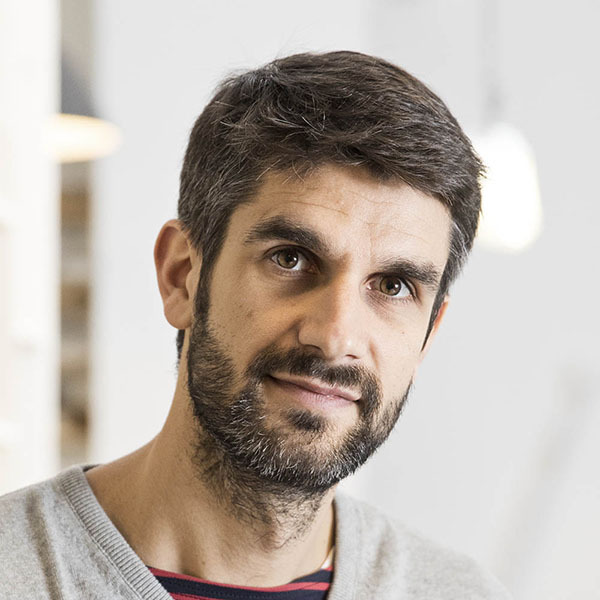 Éric graduated from the École Nationale Supérieure de Création Industrielle and specialises in the design of furniture, exhibitions and high-quality spaces. Developed over the course of ten years with the designer François Azambourg, this project is emblematic of the traditional and innovative activity of the Centre International d’Art Verrier (International Centre for Glass Arts). 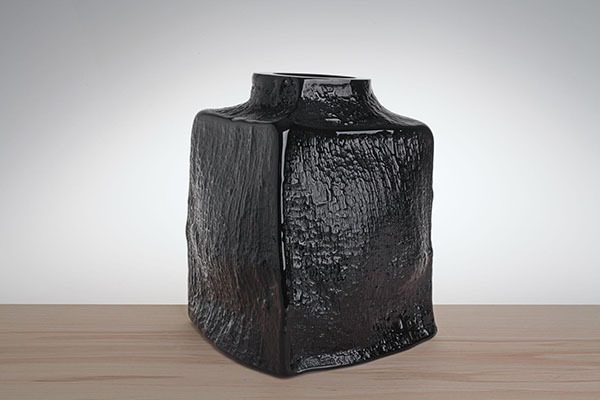 Originally, a glass vase entitled Douglas was handmade with a surface emulating the coarse wooden surface of a tree. For the tenth anniversary of Douglas, François Azambourg, Jean-Marc Schilt and Sébastien Maurer explored the creation of over 150 variations of the vase. Molten glass is hand blown and shaped. This hand worked shape is then placed into a mould where it obtains its final form. CIAV, Centre International d’Art Verrier (International Centre for Glass Arts) is located in an 18th century factory in the town of Meisenthal, France. The factory, which produced tens of millions of pieces over its life, closed its doors in 1969. After many steps were taken to convert the site, the CIAV, a public institution, opened its doors to the public. 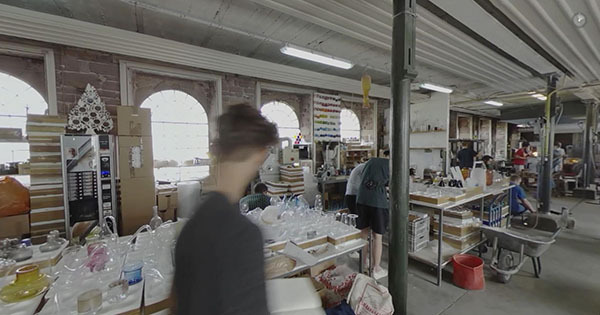 Its aim: to preserve the technical memory and knowhow of the region's glassworking heritage, to ensure its continuity and to reintroduce glassmaking techniques into current production. 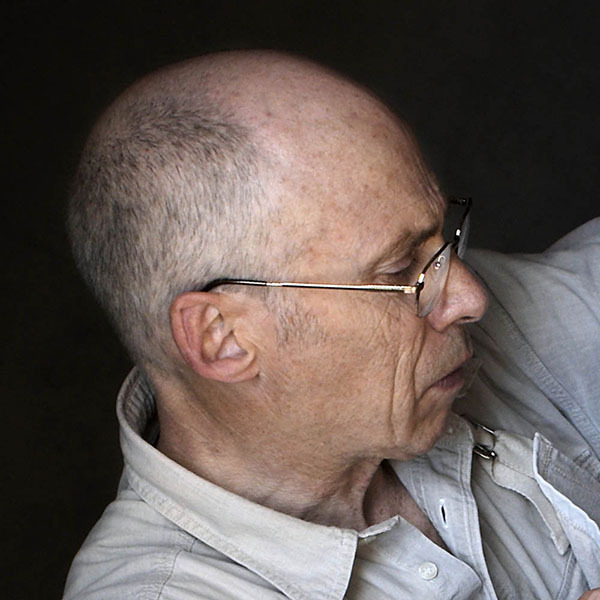 Yann Grienenberger has been at the head of the Centre International d’Art Verrier (International Centre for Glass Arts) since the 2000s and plays a key role in promoting glass arts, an emblematic craft of this French region. Yann has long believed that the sustainability of this activity lies in modernisation and collaboration. The centre, which is rooted in contemporary creation, reflects Yann’s way of thinking. Brass sheet A cut segment of an apple inspired this work. The organic shape of the infinity symbol brings the work together and creates a toroid that accentuates the work's three dimensionality. Made from a single sheet of brass, Le souffle has been entirely shaped by hammer. Solder is used to join the elements together. This brass sculpture is shaped by hand from a single sheet of brass. The brass is hammered into shape. Each individual shape is then welded together, and the joined pieces are hammered into their final form before being polished and patinated. Brass sculpture hand hammered from one piece of brass. From childhood, Nathanaël Le Berre wanted to create. It took a while for Nathanaël to find his calling, having first enrolled in various programmes to study art history then stained-glass production. He finally started a diploma in metal and graduated in 1999. He learnt the art of freehand metalwork. 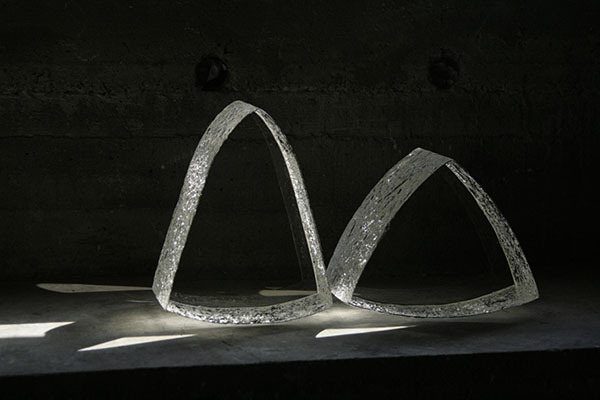 His work reflects his thoughts on curved forms and the observation of tensions. His inspiration comes from observing human forms and nature. Silver 925/1000, cotton thread Osmos is a solid silver perfume diffuser with integrated olfactory balls inspired by the Oloid form, discovered by Paul Schatz in 1929. Once suspended, the mass of Osmos gives it the necessary inertia to cause a rotating movement, allowing the air to circulate and release the scent of the olfactory balls. The duo revisited a cassolette (small container) made by master goldsmith Daniel-Jean Joubert in 1750. This solid silver container has been formed by hand. The metal is carefully shaped using instruments including hammers, plus heat. The final form is polished. Three generations of silversmiths have created handmade silver objects in the Marischael workshop. 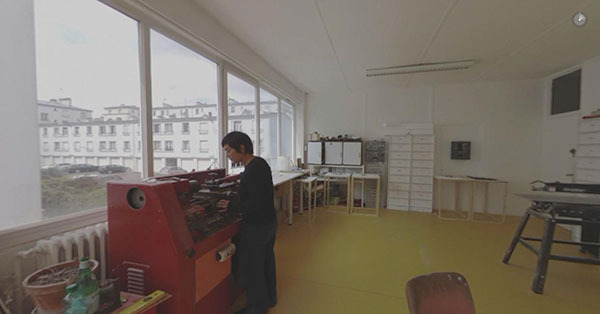 The workshop, originally located in the Parisian Marais district, recently moved to an emblematic location for crafts in the 12th arrondissement of Paris. 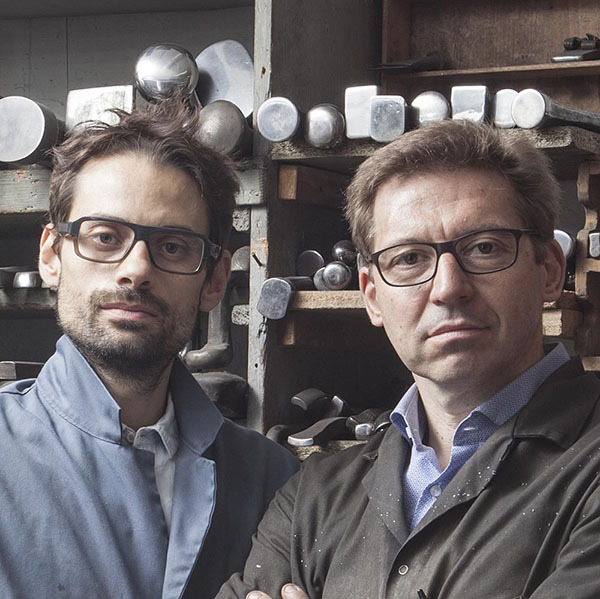 In the workshop, contemporary creations by Nicolas Marischael sit side by side with precious antique objects restored by the goldsmith or waiting to pass through his expert hands. Nicolas’ great wealth of technical knowledge permits him to restore works from museums and collections as well as creating contemporary pieces using innovative techniques that he has perfected. Nicolas Marischael follows in the footsteps of a long line of silversmiths. He often creates contemporary pieces of his own design but also works with a number of designers and artists. This practice of working with designers led him to work with Felipe Ribon. 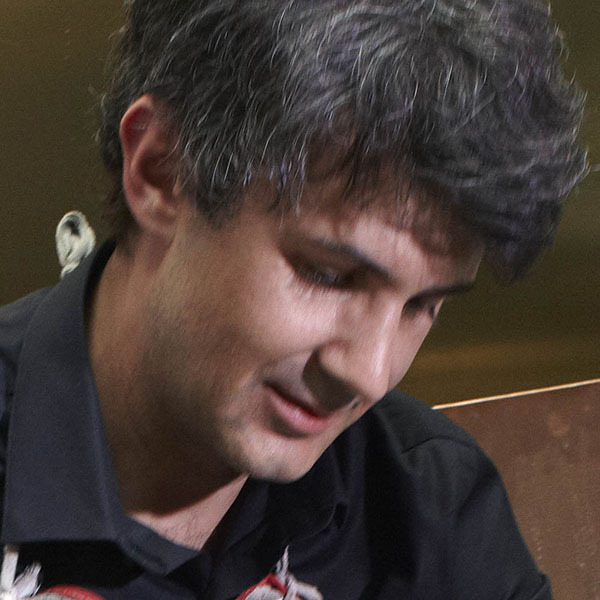 French-Colombian designer Felipe Ribon studied engineering at the École des Mines and then industrial design at the École Nationale Supérieure de Création Industrielle ENSCI (National School of Industrial Design), graduating in 2008. In 2009, he won the Design Grand Prix of the City of Paris and in 2012 was a winner of the Audi Talent Awards. Engraved plates in intaglio This series of engravings, Sidereus Nunicus, messenger of the stars, represents the moon cycle. Each page weighs about one gram. Didier Mutel chose to work with Japanese Gampi paper, and black ink. An image is incised onto a metal plate. Ink is then spread over the plate surface which is then cleaned. Ink remains in the incisions. A sheet of paper is placed on the plate that is then passed through a press, transferring the ink to the paper. An image is incised into a traditional metal plate. Ink is then spread over the plate surface which is then cleaned. Ink remains in the incisions. A sheet of paper is placed on the plate, which is then passed through a press, transferring the ink to the paper. Intaglio engraver Didier Mutel graduated from the École Supérieure Estienne and from the École Nationale Supérieure des Arts Décoratifs in Paris. Didier then went on to study at the Atelier National de Création Typographique (the National Workshop of Typographic Creations), where he gained knowledge of traditional methods of typography and applied this knowledge to contemporary creation. He teaches at the Institut des Beaux-Arts de Besançon. 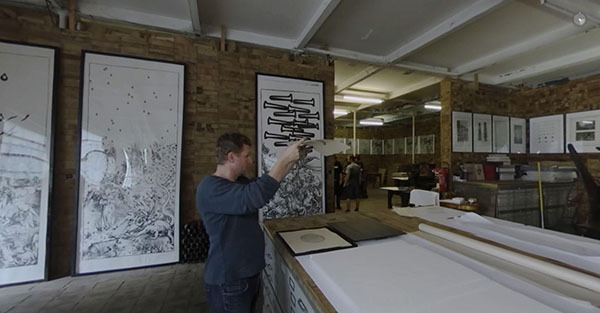 His work is characterised by a constant search for innovation based on traditional techniques of engraving and intaglio printing. Steven was inspired by the aesthetic of the erosion of rocks on geological faults. He reworked a previous drawing of rocks. The name of this piece takes its name from the WooWood technique, a way of setting marquetry on rubber that matches the shapes of objects and maintains them. WooWood is born from the desire to push the advantages of Airwood, a technique developed by ARCA Society. 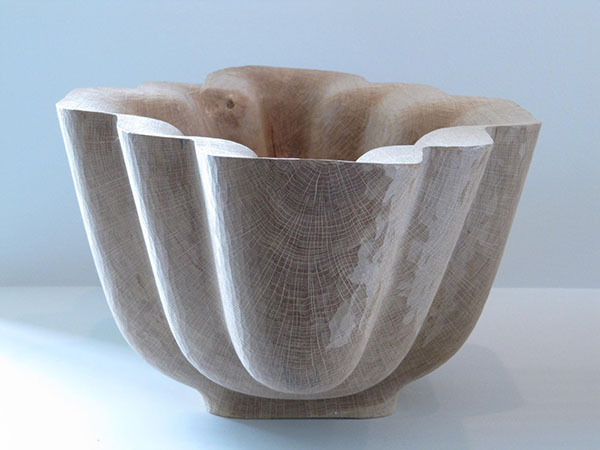 The work is created using a material called WooWood. This technology has long been used to restore antique marquetry. 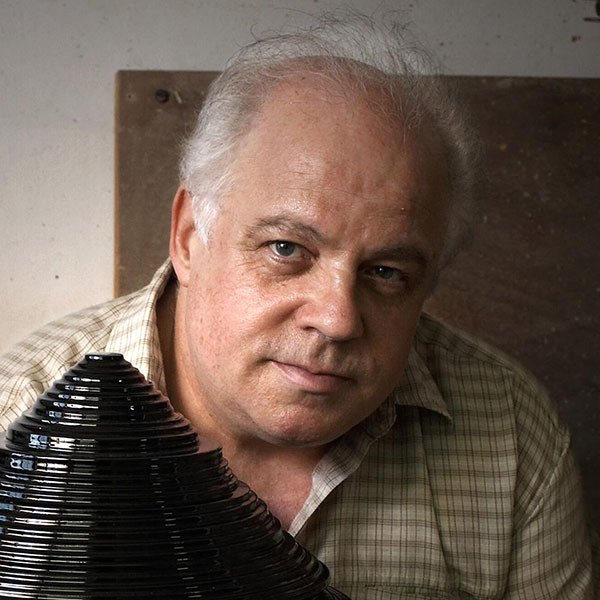 Steven Leprizé has developed the technique but more importantly has exploited it with 21st century tools: a digital cutter, and high-tech glue developed with an engineer to buffer between wood and rubber. 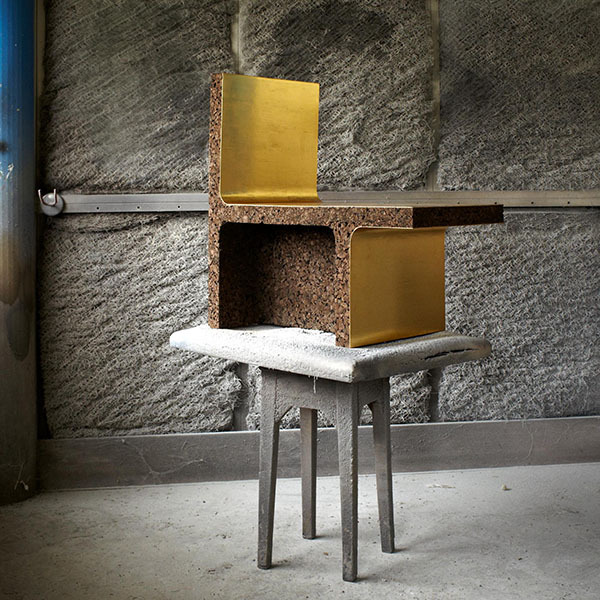 The Atelier de Recherche et Création en Ameublement, ARCA (Furniture creation and Research Workshop), is a multifaceted workshop producing innovative creations, prototypes as well as small and limited series. ARCA implements new technologies and materials using traditional woodworking methods. 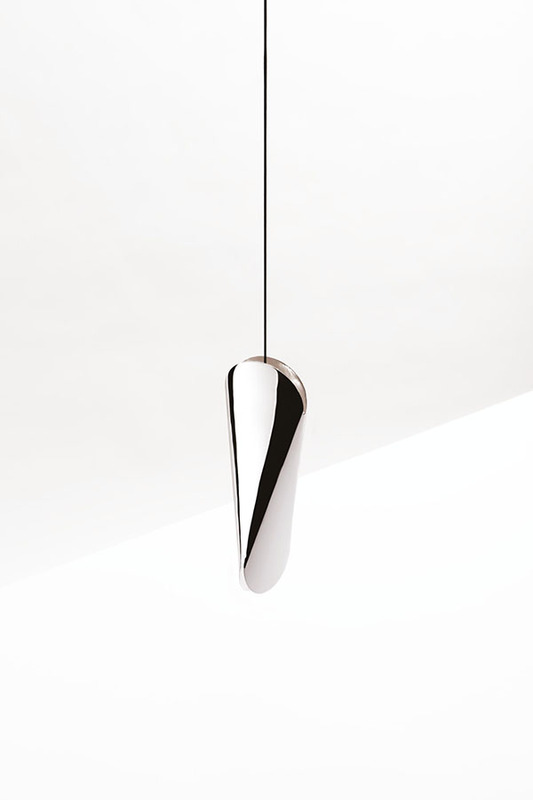 ARCA experiments with furniture creation and works closely with architects and designers. 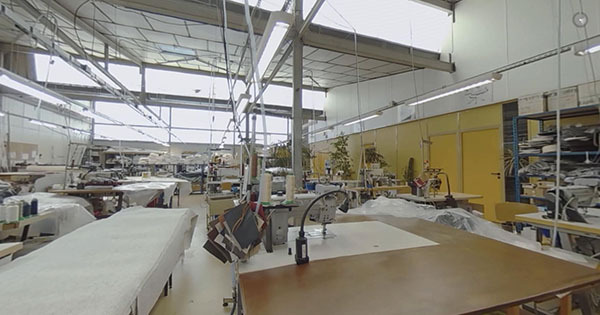 They do not limit themselves to cabinetmaking but also work with the aviation and fabric industries. 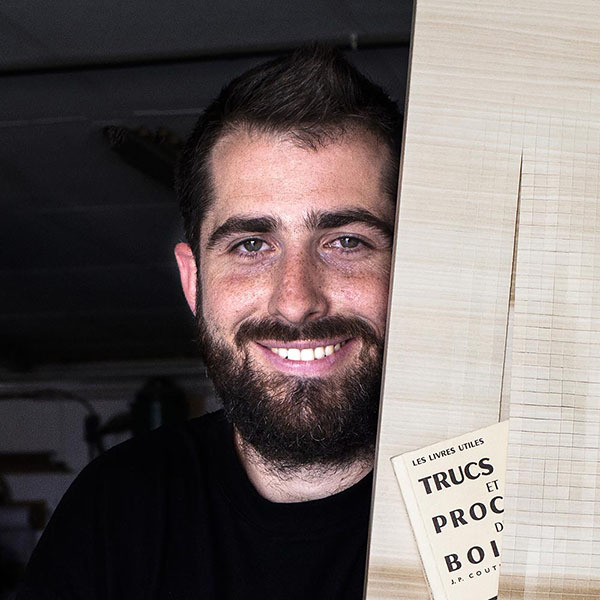 Recipient of a cabinetmaking DMA (Diplôme des Métiers d'Arts) from the École Boulle in Paris, Steven Leprizé created ARCA Ébénisterie, his own cabinetmaking workshop, with other alumni of his school. It was here that he created WooWood. The creation results from extensive research into the treatment of the wood surface, conducted in his workshop. Master cabinetmaker Steven Leprizé distinguishes himself by his relationship with innovation and his ability to conceptualise wood in all its forms. He is greatly interested in passing on his knowledge, both in the context of his workshop and at the École Boulle where he teaches. The work is created using a material called WooWood. This technology has long been used to restore antique marquetry. Steven Leprizé has developed the technique but more importantly has exploited it with 21st century tools: digital cutter, high-tech glue developed with an engineer to buffer between wood and rubber. Research has always been at the heart of Aki and Arnaud Cooren's work. Their encounter with an atypical character like David of Gourcuff allowed them to implement their taste for innovation. Fusions SARL started as a foundry installed in David de Gourcuff’s garage. A few years later, this developed into a factory with more than thirty artisans. 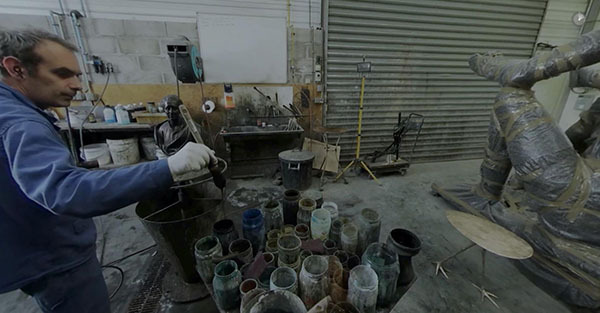 The foundry in the Puy de Dôme department in France gives life to works designed and commissioned by national and international artists and designers. Fusions SARL started as a foundry installed in David de Gourcuff’s garage. A few years later, this had developed into a factory with more than thirty artisans. The foundry in the Puy de Dôme department in France gives life to works designed and commissioned by national and international artists and designers. Aki Cooren is the daughter of a Japanese jewellery designer. She grew up moving between France, Japan and the United States. She returned to France at the age of 18 and studied interior and product design at the École Camondo. Arnaud Cooren was born and raised in northern France. He first studied contemporary art in Belgium before moving to Paris to study at the École Camondo. Engraver and typographic printer Didier Mutel has an exceptional technical knowledge but his practice also constantly evolves in a daring, sensitive and poetic manner. The richness of his personality and his desire to convey his practice makes this testimony essential. An image is incised onto a traditional metal plate. Ink is then spread over the plate surface which is then cleaned. Ink remains in the incisions. A sheet of paper is placed on the plate, which is then passed through a press, transferring the ink to the paper. The work of this label is valuable not only because it supports exceptional craftsmanship, but also because of its interest in economic and social issues. The label perfectly embodies the values of the Prix Parcours, giving the Foundation the opportunity to support a vital initiative for this region. The Fédération Française des Dentelles et Broderies was created in 1935 to group professionals from four lacemaking sectors. The Federation now represents 50 companies for approximately 2,000 people. The Federation has several key aims such as guaranteeing French lacemaking fabrication, tradition, quality and knowhow, protecting the knowhow of companies by fighting counterfeiting, promoting its members, and organising competitions for fashion, textiles, applied arts and design schools with the intention of attracting future designers to lace and embroidery and develop the creative and innovative potential of these materials. Romain Lescroart is the President of the Fédération Française des Dentelles et Broderies (French Federation of Lace and Embroidery). Nicolas Marischael is the successor of a dynasty of goldsmiths, Felipe Ribon is a visionary designer. Their joint work testifies to a productive complicity, brought to life by a perfect knowledge of one another’s talents and a successful use of their complementary knowledge. This solid silver container has been formed by hand. 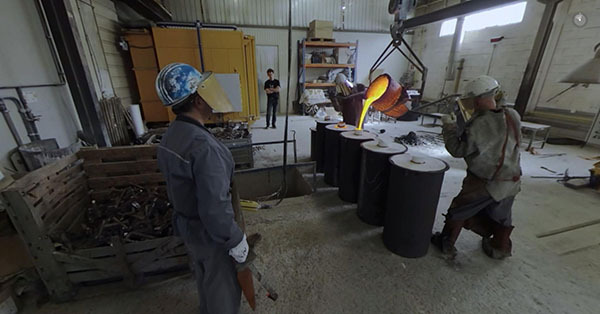 The metal is carefully shaped using instruments such as hammers, and heat. The final form is polished. These two strong personalities describe the creation of a work entirely made by four hands. Printed on Japanese paper, it displays both editorial and aesthetic innovations. This exceptional work signalled a decisive turning point in both of their careers. Laurent Nogues and Christian Bessigneul have worked together for the past fifteen years on this type of project. They create visual books, combining captured photographic illustrations and illustrations built and drawn with tools, respecting the strictest embossing traditions. Such work allows the blind to read books made in relief. Paper embossing: the process of creating either raised or recessed relief images or designs on paper by applying pressure to paper. An image is pressed into paper or cardstock to create a three dimensional design. Metal engraving: the technique of incising a design onto a metal, usually flat, surface by cutting grooves into it. Processes of creating either raised or recessed relief images or designs on paper by applying pressure to paper. An image is pressed into paper or cardstock to create a three dimensional design. Laurent Noges created Créanog in 1994. 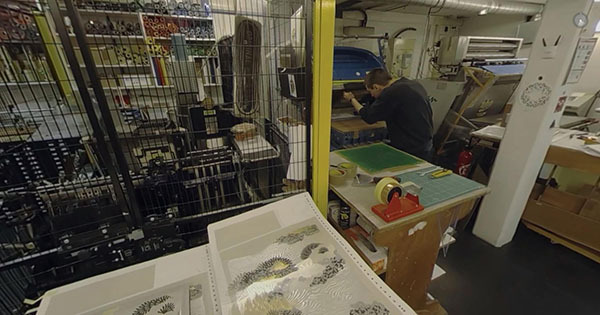 Créanog is both a studio and a workshop specialising in the hot stamping technique. For more than 20 years, the studio has produced works for a number of fields such as jewellery, fashion and beauty as well as the champagne and spirits industries. The studio puts great importance on perpetuating traditional knowhow and innovating and building on it by reinterpreting techniques, experimenting and opening new paths, both in terms of aesthetics and practices. Laurent Nogues is an embosser who graduated from the Ecole Olivier de Serre and decided to work with the Créations Fournier printing house that had long been managed by his father. In 1994, he created his own company Créanog. Laurent constantly seeks to innovate and push boundaries. His series of tactile embossed books was born from this desire. These books give the blind the possibility of discovering French heritage though embossed images. 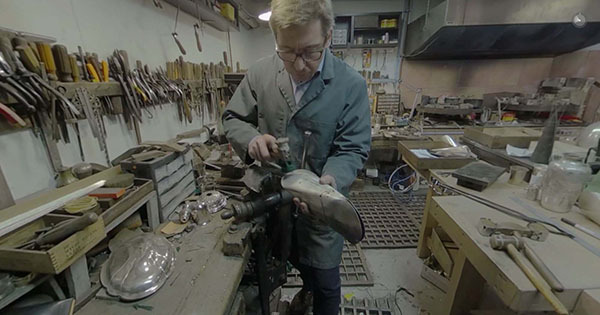 Passionate guide of the Pôle d’excellence des Matériaux souples (Centre of Excellence of Soft Materials) at the Compagnons du Devoir, Grégoire Talon guides us in the daily life of this institution and presents his remarkable colleagues, who speak of their vocations. The Association ouvrière des compagnons du devoir et du tour de France was set up in 1901 to create and coordinate training and apprenticeships of several trades following traditional techniques. Students undertake varied training in numerous artisanal techniques. For cycles of six weeks, students train in one workshop then continue for two weeks back at the centre. This method is repeated throughout the diploma. Once the students obtain their diploma they are eligible for the Tour de France programme. Core to this programme is the notion of travel. For three to six years students travel around France and around the world to perfect their technical knowhow. Students are found in 45 countries over five continents. Grégoire Talon studied at the Haute École des Arts du Rhin, graduating with a degree in fine and plastic arts followed by design and applied arts studies at ENSCI. Grégoire started to work with the Compagnons du Devoir in 2010 and in 2015 became the director of the Center of Excellence of Soft Materials section of the Compagnons du Devoir. 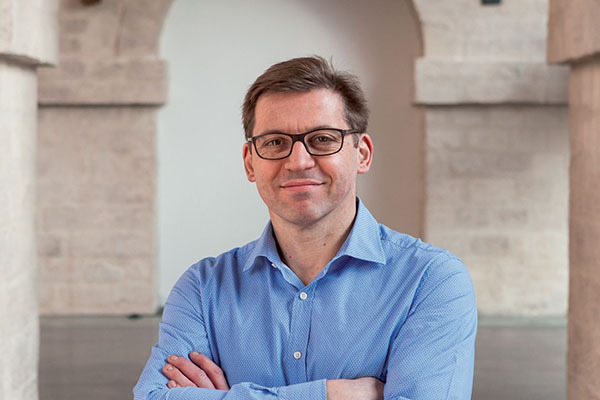 Director of the Centre International d’Art Verrier (International Centre for Glass Arts), Yann Grienenberger, has developed a magnificent institution in a region where the craft seeking to be preserved is in great difficulty. Dedicated to the art of glassmaking, the CIAV was created on the site of a former factory converted into a contemporary art and training centre. Mylinh Nguyen’s creative distinctiveness is primarily due to her exceptional knowledge of metalwork, a field seldom specialised in. She has invented and developed many techniques. Mylinh likes the idea of "collective intelligence" and integrates her experience in her work. A central component to her work is turning the metal. This rigid technique provides her with the possibility of creating minute details. She has developed a method that consists of turning pieces, assembling them and then turning them again, creating plant and animal-like forms. A central component of this work is turning the metal. This rigid technique provides the artisan with the possibility of creating minute details. She has developed a method that consists of turning pieces, assembling them and then turning them again, creating plant and animal-like forms. Inspired by both living and extinct animal forms, master metalworker Mylinh Nguyen welds fantastic sculptures from brass, bronze and silver. Each work originates as a sketch before taking shape as an intricately detailed metal sculpture. Her works articulate the smallest details of fantastic animals such as the minutely detailed tentacles of her sea creature sculptures. She has been fascinated by metal turning since the very first time she tried this technique and enjoys the different states of malleability of metal. Parallel to her larger works, Mylinh also produces jewellery and accessories that are also inspired by an animal theme. Mylinh trained in two artisanal techniques. 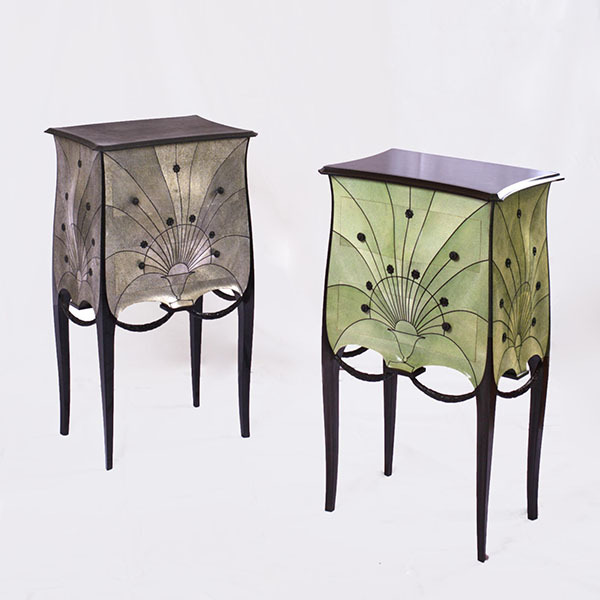 She holds a diploma in metalwork from the National School of Applied Arts and Crafts Olivier de Serres and a diploma in embroidery from the School of Applied Arts Duperré in Paris. The development of Maison Siegeair's traditional work was turned upside down when it encountered the world of design. This exchange allowed the company to question its know-how and open up its work to unexpected and exciting fields. Technique of covering the surface of furniture, typically seating furniture, with fabric or leather covers as well as padding, springs and webbing. Created 35 years ago, Siegeair counts on numerous master artisans such as upholstery workers, tailors and makers of chairs to realise furnishing designs finished to the highest possible quality. They worked on the dining room designed by Pierre Paulin for the Élysée Palace in Paris, benches for the European Parliament in Strasbourg and curtains for the French National Assembly. Saddler Jean-Paul Mahé graduated from a technical university with a degree in mechanical engineering, training in sewing techniques and leatherwork. For this combined project, Jean-Paul uses foam and mesh fabric to create the piece, adapting methods acquired in sewing workshops and tanneries. Seat carpenter Maurice Barnabé studied at the École Boulle, Paris, where he obtained a certificate of professional aptitude in upholstery. He joined the Maison Siegeair in 1983 and became the head of the carpentry workshop in 2006. 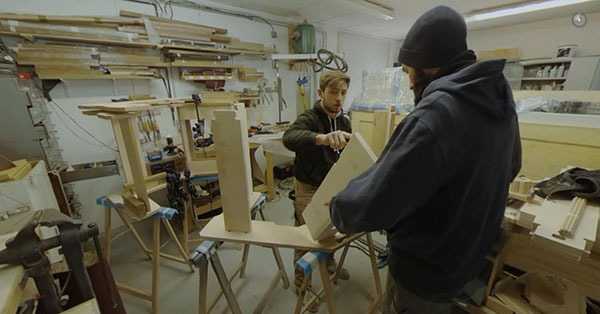 For this project, Maurice makes raw wood elements for furniture. Bernadette N'Guyen works as a cutter and tailor at Maison Siegeair. She graduated with a certificate of professional aptitude in sewing in 1980. 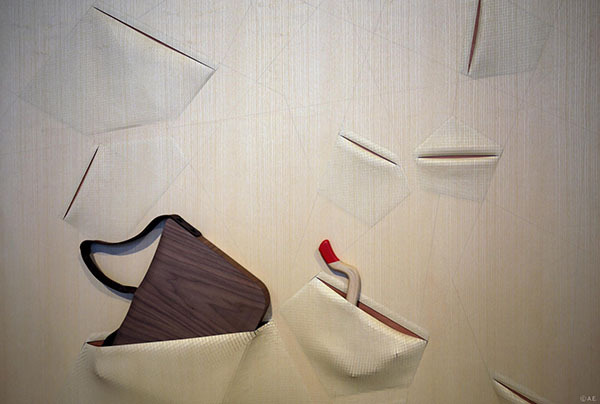 For this project, Bernadette assembles the different parts made of leather and fabric. Austrian born Robert Stadler studied design at the IED Milan and at the ENSCI, Paris. In 1992, he cofounded the Radi Designers group , which stayed active until 2008. The group produced commissioned pieces for Galerie Kreo and major industrial commissions such as the meal set for Air France. In 2001, Robert set up his own design studio that produces works for numerous names in the luxury industry and limited edition designs for carpenters. His works are to be found in a number of museums such as the MAK in Vienna, and he has himself curated several exhibitions. Robert’s designs question objects' identities and explore the exhibition space to distort the usually defined categories of art and design. Guillaume Bardet's experience is a perfect example of the transposition of know-how. 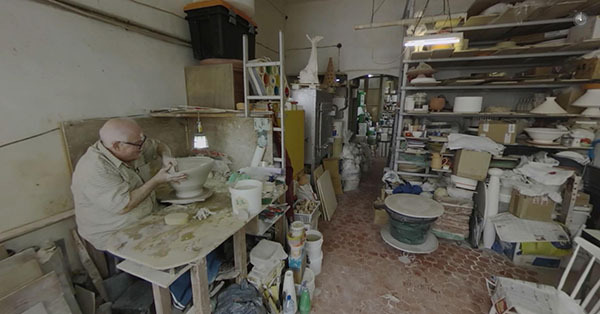 This film reveals everyday gestures and plunges us into the world of a ceramics workshop which mixes traditional techniques and new technologies. Guillaume drew one object a day for one year. The ceramicist from Dieulefit (a town whose name means “God made it”) then realised his works. They show respect for the past coupled with a passion for modernity. Guillaume Bardet drew one object everyday over a year. Numerous ceramics from Dieulefit in the French Drôme region then used a number of hand-worked techniques to materialise his drawings into ceramic creations. Dominique Pouchain is a bronze and ceramic worker. He carried out his apprenticeship in the family workshop. 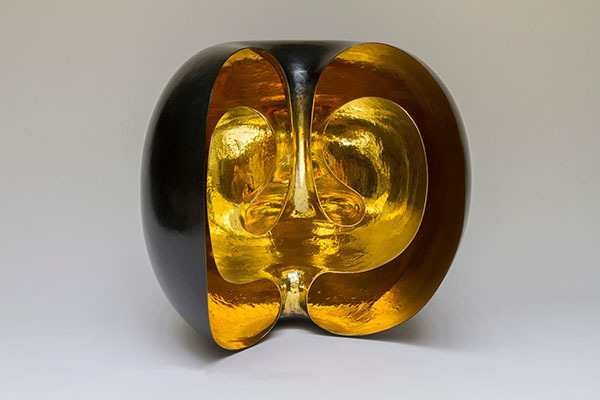 He started to explore sculptural works in 1981, and since 1985 has exhibited his works. He has produced sixty works with Guillaume Bardet. Born in Wisconsin, United States, Raelyn Larson finished her Bachelor of Fine Arts at the University of Wisconsin in 1993. 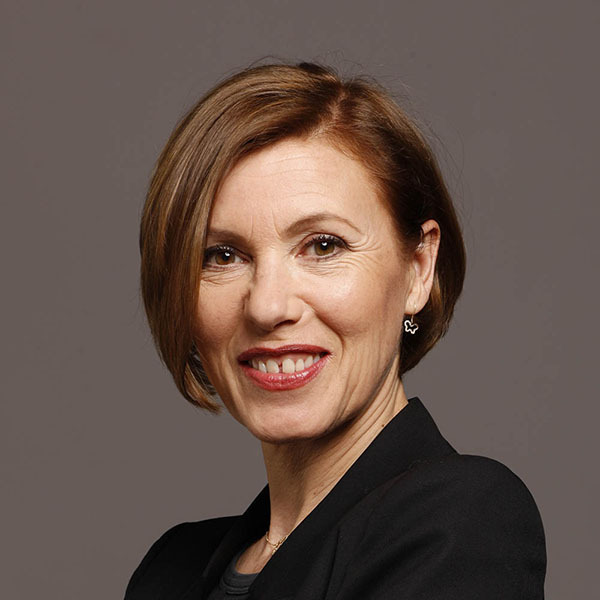 In 1994, she moved to Paris, France, and then to the Drôme region in 1997. She here met Guillaume Bardet and has produced a dozen works of his. An artisan's daughter, Séverine Dufust studied at the fine arts school in Cherbourg. In 2005, she obtained an aptitude certificate in ceramic turning and continued her professional training in 2010 at a ceramic house in Dieulefit. Séverine has produced sixty pieces for designer Guillaume Bardet. Jean Dufour started working in a workshop from the age of sixteen. He received his professional diploma in ceramic art in 2004 and a diploma from the Maison de la Céramique in Dieulefit, France in 2011. He has produced twenty pieces for Guillaume Bardet. Zélie Rouby received her professional diploma in ceramics turning in 2004 and a professional diploma in ceramics from the Maison de la Céramique in Dieulefit, France in 2008. She has produced sixty pieces for Guillaume Bardet. Born in 1988, Quentin Marais arrived in Dieulefit in 1989. He graduated with a professional aptitude diploma in ceramics from the same city in 2009. For Guillaume Bardet he interpreted two ceramic works. Born in 1971 in Rouen, Guillaume Bardet moved to Paris at the age of 15. He competed his studies at the École Nationale Supérieure des Arts Décoratifs, Paris, in 1999 and worked with Jean-Marie Massaud until 2001. Since then, he has worked independently for a number of European companies. Guillaume develops innovative designs for home furnishings including intensive studies related to lighting. He has also developed his activity as an interior designer. Since 2005, he has taught in the ateliers of the École Nationale Supérieure de Création Industrielle. In 2009, he moved with his family to Dieulefit in the Drôme region. Winners of the first edition of the Prix Dialogues, Claude Aïello and Mathieu Lehanneur perfectly embody the spirit of this award, since they complement each other in a productive way. Their work combines the brilliancy of a singular designer and the know-how of a master ceramicist. The designer created the dimensions for the vessel and the ceramicist carefully turned clay to reach the exact dimension necessary. The final ceramic vessel was glazed with a dark colour in its exterior and left white in its interior. François-Xavier Richard brilliantly illustrates the contribution of a contemporary vision to a craft in rapid decline. This outstanding artisan experiments, shakes up traditions and gives life to paperwork while evoking its importance from an aesthetic and societal point of view. Emmanuelle Dupont is one of those creators who transforms tradition, revitalising professions that are on the way to being forgotten. She has a highly creative way of working, which she is constantly questioning. Made from yarn and thread in open patterns, this lacework uses traditional stitching techniques to create sculptural and paint-like works. Emmanuelle Dupont graduated in 2005 from the École supèrieure des arts appliqués Duperré (ESAA, Paris) in textiles and lacework. She developed her own style of lacework, giving this medium an artistic status of its own. She defines herself as a painter and sculpture who uses lace as her primary material, exploring visual and tactile elements of lacework. Her work uses traditional stitches while developing new, innovative pieces. Her subjects revolve around the animal kingdom and vegetation. She produces work for brands in the luxury industry such as Valentino, and has worked on numerous projects including the creation of jewellery. Ludovic Avenel is considered the leader of a new generation of cabinetmakers, respectful of its past but anchored in the 21st century. His vibrant personality and his desire to pass on his knowledge should awaken the desire in others to undertake this profession. Age old materials and unconventional contemporary materials are worked on with traditional tools following age-old cabinetmaking techniques to produce these two cabinets. Roland Daraspe is part of the great tradition of artisans who combine personal creativity and mastery of a demanding craft. Master of Art, he devotes a large part of his time to passing on his knowledge to younger generations, imparting his values as much as the virtuosity of his techniques. Reinventing traditional goldsmith techniques, Roland Daraspe creates tableware and decoration works by hand. Named Master of Art in 2002 by the French Ministry of Culture, Roland Daraspe is an essential goldsmith reference in France. He first trained as a boilermaker and later as a naval aviation mechanic. For a while, he was interested in glasswork, but came back to metalwork. He produces works for tableware and decoration. He approaches goldsmith work in an innovative manner, reinterpreting traditional methods of working precious metals as well as creating new gestures. His creative process also involves drawings. His works can be found in numerous collections and galleries in France and around the world. Roland is eager to pass on his knowledge, and has over the years taken on a number of trainees and apprentices. Passionate about literature, Florent Rousseau welcomes us into his workshop in the heart of New Athens in Paris. He introduces us to the intimacy of a bookbinder who passionately practises his art and passes it on through his teaching, as demanding as it is generous. Book assembled from an ordered stack of paper using binding techniques from the Middle East. Florent Rousseau is a graduate of both the Union Centrale des Arts Décoratifs (UCAD, Paris) in binding, gilding and decoration, and the Estienne School (Graduate School of Arts and Graphic Industries) Paris, in binding and decoration. Florent undertook an apprenticeship in leathers and skins in the family workshops les établissements Jullien in Paris. 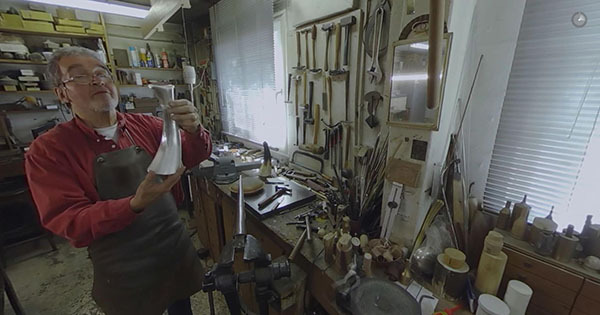 In 1988, he opened a small workshop in the same city and worked to bringing bookbinding techniques from the Middle East to the Western European book market. 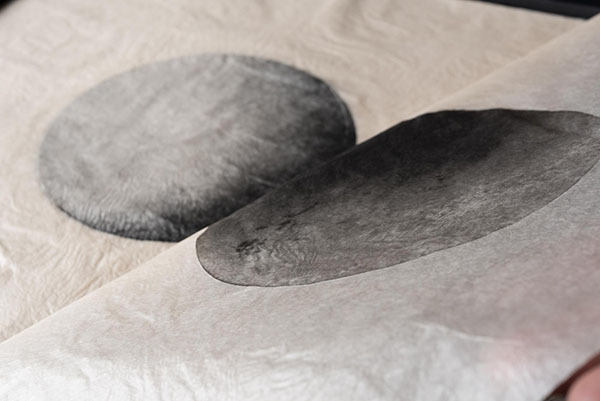 He has experimented with numerous materials and techniques focusing on transforming paper and leather. Adamant in his desire to pass on his knowledge, Florent taught techniques of bookbinding and decoration and founded the APPAR (Association Pour la Promotion des Arts de la Reliure) in the mid-1990s, to teach both amateurs and professionals.